With twelve satellite offices all over Ontario, our Liaison Officers travel the province to encourage students to make informed decisions about their future. 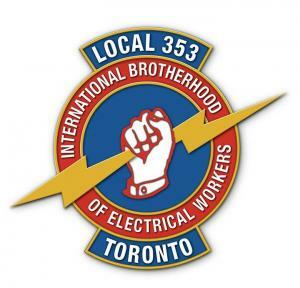 Since 1998, we have been delivering our presentation What’s Out There in the Skilled Trades and Technologies? to educate students on the hundreds of career opportunities available in the construction, motive power, service, industrial and technology sectors. This interactive, 45-60 minute multimedia presentation is updated annually and is available in both English and French, as well as a workshop format geared towards First Nations, Métis, and Inuit (FNMI) audiences. The largest outreach program in our lineup, this program reaches over 125,000 elementary and secondary students per year in schools, and Friendship Centres and Band Offices. In the last decade, we have reached over 1 million youth in Ontario through this program. 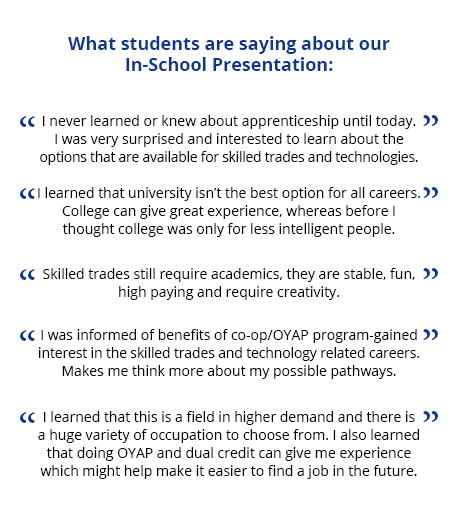 Supported by the Ministry of Education, the Ministry of Advanced Education and Skills Development and many community colleges, organizations and community partners, Skills Ontario’s presentation program is the perfect complement for all career exploration or development courses. Skills Ontario offers this presentation in French, too. The French presentation is available province-wide. Skills Ontario delivers a version of its presentation program geared toward FNMI students and under-employed adults living in Ontario. Delivered in schools and friendship centres, the presentation includes information that is culturally relevant to FNMI Communities and includes a hands-on activity. It is available province-wide. The Far North “Trades & Tech Days” interactive, career exploration events for elementary students in Northern Ontario. 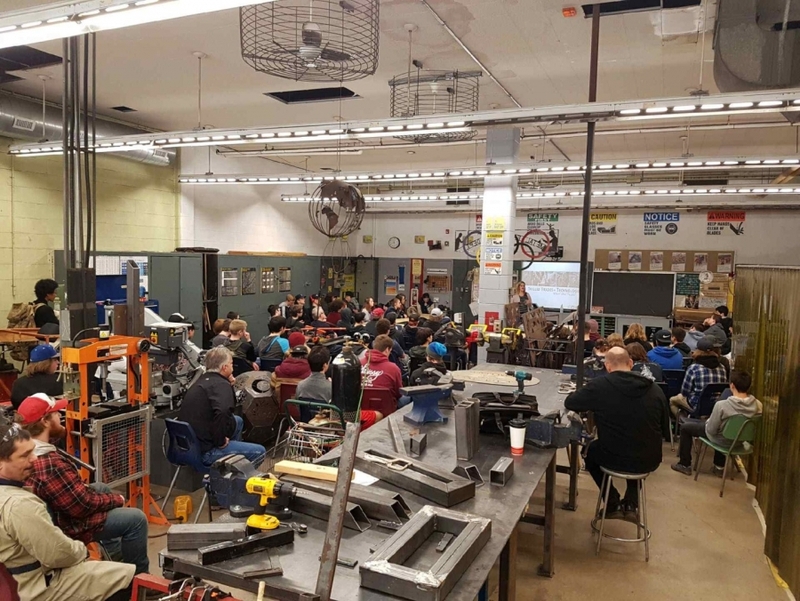 Because access to events such as the Skills Ontario Competition can be more difficult for students in Northern Ontario, this event provides them both with the information of our in-school presentation program and the opportunity to participate in hands-on workshops. This combination allows students to actively explore the knowledge and skills involved in skilled trade and technology occupations.